Good morning ! Last night I worked on the mantel for Halloween .. I made a banner with book pages and letters cut on my Cricut . I just freehanded the banner shapes and cut 3 pages for each pennant, hot glued them together and then used mod podge on the top of them and to hold the silver glitter on the edges. I punched a hole into the top of each pennant then used ribbon to tie it to tulle ribbon . I got the crows at the Dollar Tree store, and also that black drapey scary looking cloth under the banner. 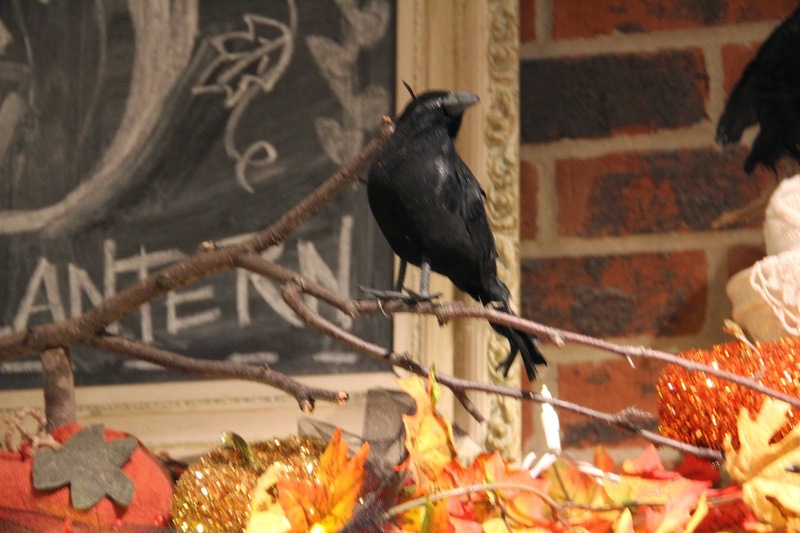 I used a branch from a tree in our yard to lay across the mantel for a crow to sit on. 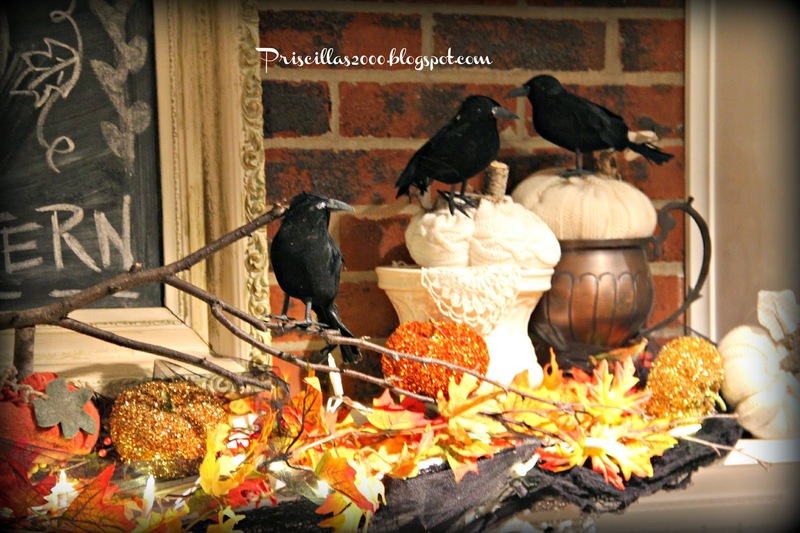 Some of the crows hanging out ...I used off white sweater pumpkins to place the crows on.. I left the leaf garlands from the Fall mantel and there are white lights added in.. 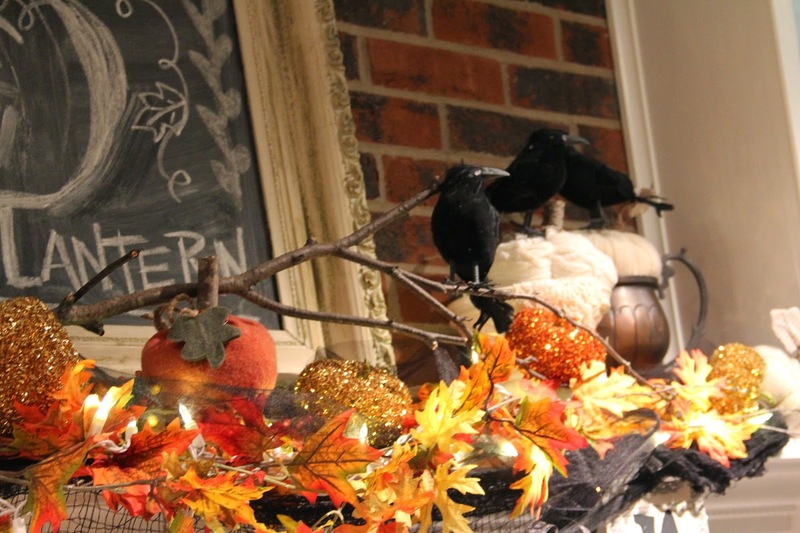 Crows , an owl and sweater pumpkins..The glitter pumpkins are from Walmart ..I used those in the Fall mantel also ..
A close up of the banner.. I love how it turned out .. Thanks so much for visiting ! 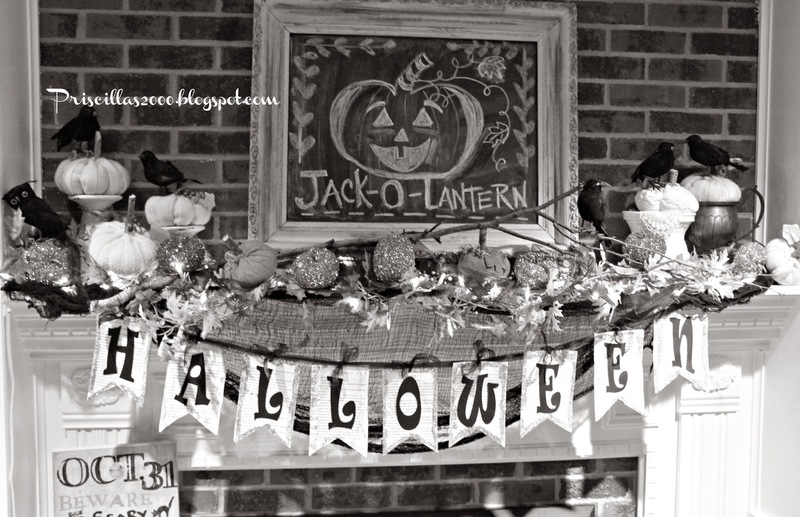 Thanks so much to Cozy Little house and A Stroll Thru Life for featuring my Fall home tour and Front Porch Ideas for featuring my Front Porch and Pumpkin Picking ! 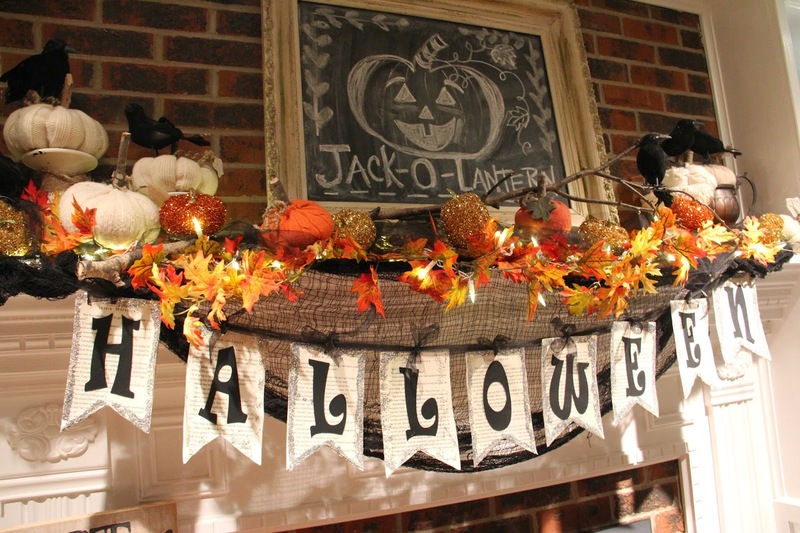 Love your mantel and all of your Halloween touches. That banner is fabulous! Hi Priscilla. I love the Halloween banner! So cute. And it does look great in the black and white shot. I have one of the crows, and love it. I use it in my outdoor display. I have not been able to find more. I will pop into Dollar Tree today. Hooray for Chelsea's new chalkboard. Looks so great there on your mantel! 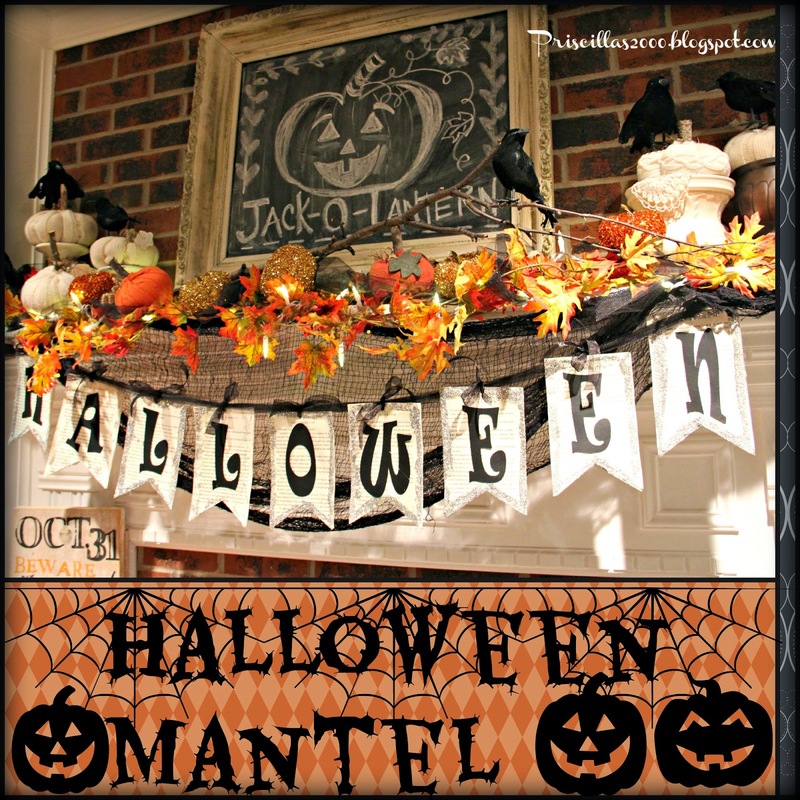 Love your mantel-the sweater pumpkins are adorable! Oh my goodness. I just love what you did to the mantle. Very Halloween. 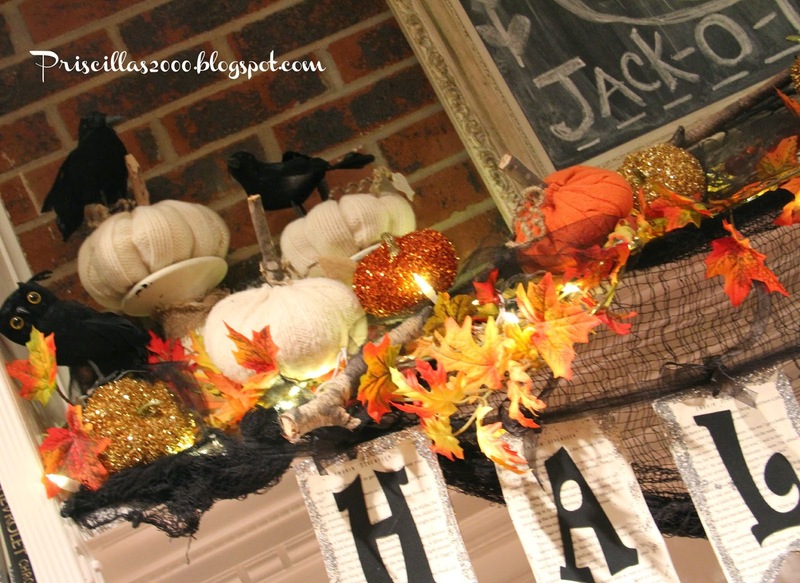 Love your Halloween mantel! 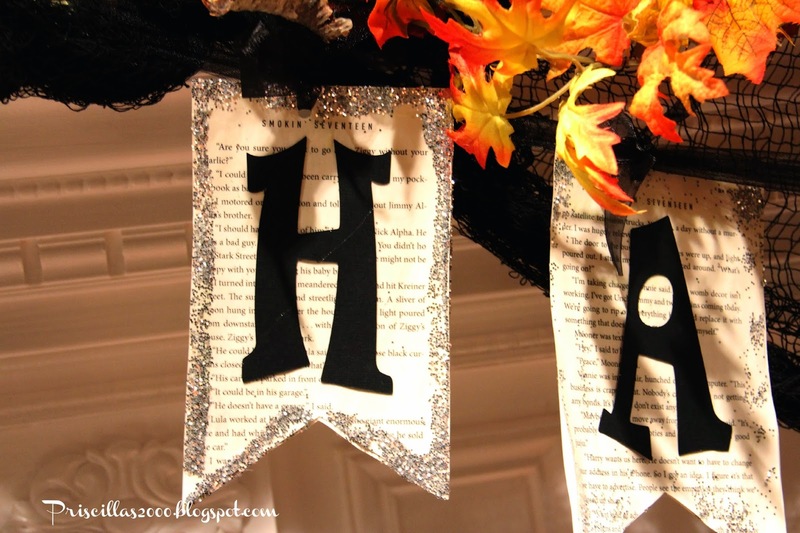 Your banner turned out great, I love the idea of using book pages, I made mine last year from copies of newsprint. :) I also love your birds and chalk board! I always enjoy seeing your décor. Since I'm a new visitor to your blog, I feel that there will be a lot more for me to enjoy. 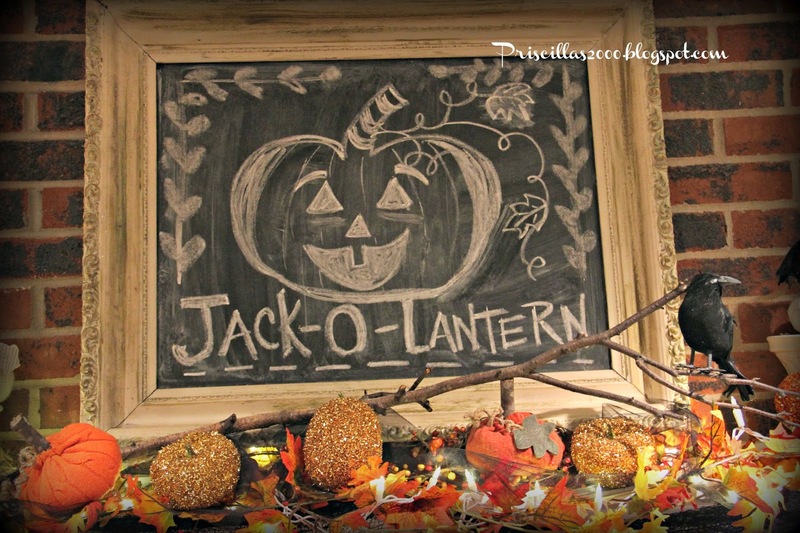 Your and your daughter's frame/chalkboard is great as is your banner..
Wishing you and your family a happy Fall and Halloween season. Priscilla, I love the new banner and the framed chalkboard is so cute! 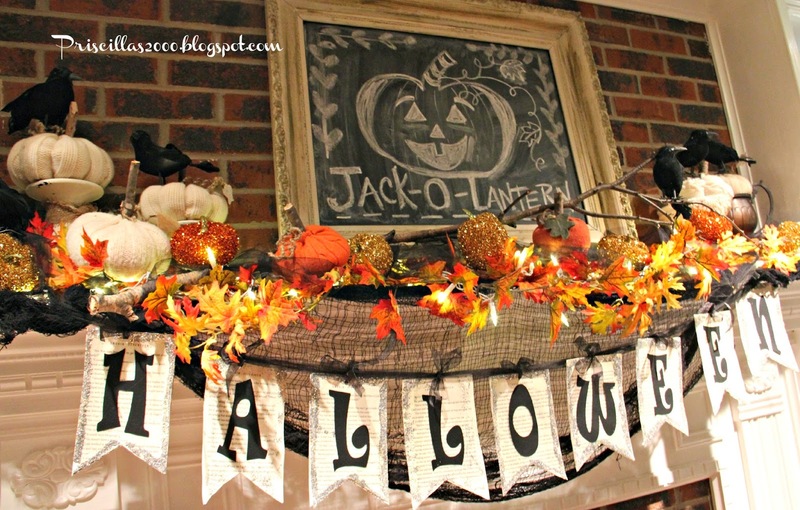 All of your Fall decor is gorgeous! Thanks for sharing with SYC. I love our Halloween mantle! Your banner is adorable and so festive! LOVE and pinned! I love your mantle, it looks wonderful! I love the way you hung the black mesh and the banner over it, it really pops! LOVE the Blackboard and Frame! This is something that i have to try my hand at when I finally find some time! 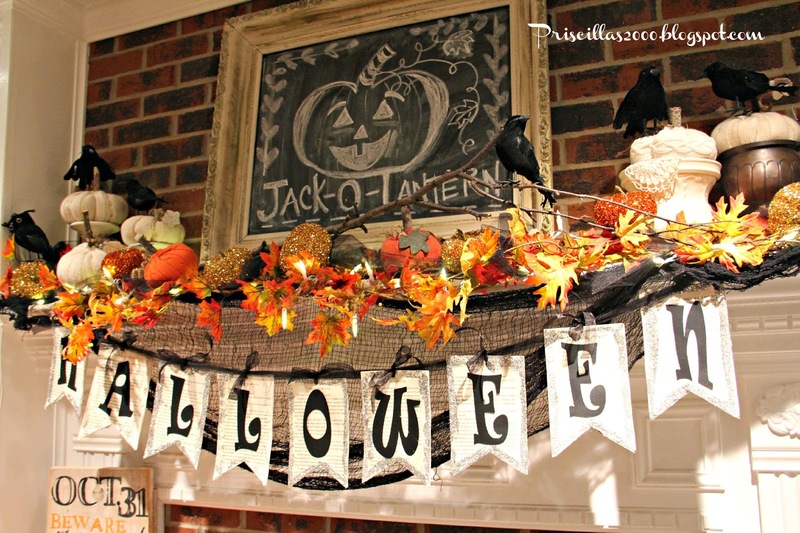 !I am so partial to pumpkins and crows so i love this!! Great job!! Love your mantel! It is so fun and festive. The crows are wonderful! It must take you so much time to set up everything! You must have a big storage closet! 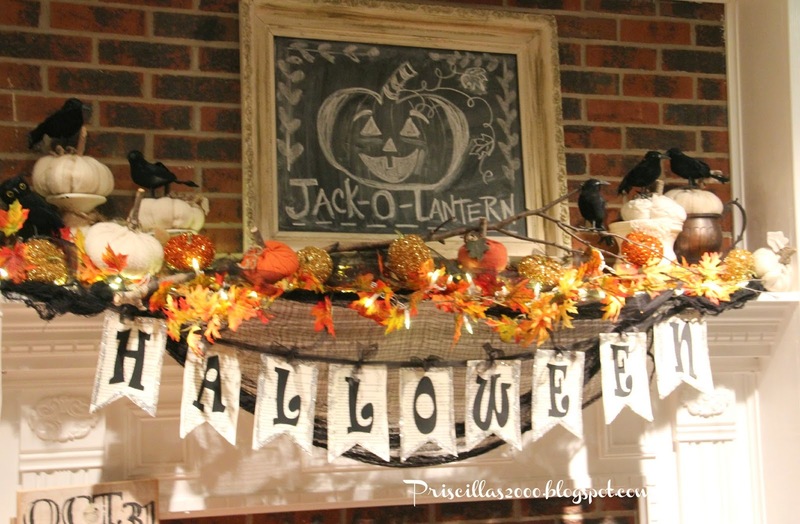 Love your sparkly mantel :) And you've got so many cute pumpkins!